An Arizona drivers license renewal is required for all motorist who wish to maintain their driving privileges. In general, this procedure allows the state to keep track of which residents are still eligible to operate vehicles on public roads. Unlike most states, a DMV license renewal in AZ can only be done in person, as you will be required to have your picture taken and your vision checked. Thus, to do so, you will need to visit a Department of Transportation (DOT) office in person. It is important to note that renewing a driver’s license is different from getting it replaced. A renewal is required based on when your license was issued, and is used to keep your credential’s picture and information up-to-date. On the other hand, a driver’s license replacement occurs only if your credential has been stolen, lost or irreparably damaged. In this article, you will learn where to renew a drivers license in Arizona, when you should do so and how much it costs. 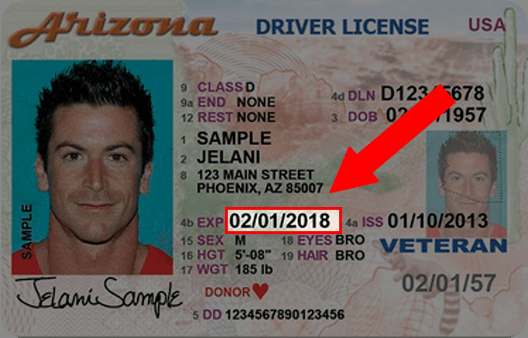 Note: The expiration date of your official AZ driver’s license is located on the front of it, right under the address of residence of the driver. The most significant drivers license renewal requirements in Arizona include that you must have a valid driving credential that has not yet expired. Overall, you can renew a license as early as six months prior to its expiration date. You cannot renew a driving license if it is not within six months of its expiration date. Instead, you can only request a duplicate credential. Furthermore, in the event that your license has been suspended, canceled or revoked, you will not be able to renew it. Rather, you will first need to get it reinstated. How early can you renew your drivers license in Arizona? You can renew your license in Arizona no more than six months before it is set to expire. An expired drivers license in Arizona cannot be renewed, which means you will have to retake your driver’s test after the date of expiration. Whether or not your license has expired, you are required to get a vision test every time you go to the DMV to renew your license. In Arizona, motorists must visit a drivers license office in order to renew their licenses in person. This requirement pertains to the fact that, during an AZ DMV license renewal, your driving credential will be updated with a new picture of yours. “Where can I renew my drivers license in Arizona?” In general, the AZ DOT offers a number of locations throughout the state, all of which are able to process renewal requests. There are also certain establishments that are certified to perform DMV license renewals, such as driver training schools. However, if you choose to renew your credential through a third-party establishment, be mindful that costs and requirements may vary. Therefore, make sure to contact the business ahead of time and learn about their procedures. Understanding how to renew a driving license in AZ is simple. Overall, the only form of identification you will need to bring to the procedure is your current license to drive. Then, you must fill out the drivers license renewal form, where you will need to provide basic personal information such as your full legal name, eye color and Social Security Number (SSN). Generally, this form is provided online through the official AZ DOT portal. In order to pay for the DMV license renewal fees in person, you will need to submit an acceptable payment method, which may include cash, money orders, checks or debit/credit cards. Because all Arizona DMV license renewal applicants need to visit a DOT branch in person, there is not a separate process for military service members to renew their credentials. However, veterans and service members can get a designation on their cards showing that they have served in the U.S. military. Furthermore, when filling out the Arizona drivers license renewal form, you will be required to identify your status as a military service member or veteran. In addition, you will need to bring to the DOT branch certain official documents that verify your military status. More often than not, bringing in a military identification card will suffice. In order to obtain a REAL ID credential when renewing your driving license in Arizona, you will need to bring a set of documents proving your identity, residency status and Social Security Number (SSN). The REAL ID federal initiative aims to increase airport security, ensuring that all forms of ID meet strict standards. Starting in September 2020, all U.S. citizens will be required to show a REAL ID-compliant credential in order to board a domestic flight. In order to meet the REAL ID requirements when you renew a driving license in AZ, be mindful that you can prove your identity by submitting your passport or birth certificate. Your Social Security card will most commonly be used to verify your SSN, but you can also use a W-2 form. In order to prove your state residency status, you will need two pieces of correspondence showing your address, such as bank statements and utility bills. The Arizona driving license renewal fee is $25. If you are not an AZ resident, you will be charged $5 to undergo a vision screening while renewing your license.